Today in Illinois, former Mexican president Felipe Calderon will be the keynote speaker at the World Leaders Forum at Judson University in Elgin. The choice is not surprising considering the keynote speakers in previous years: Condoleezza Rice and Tony Blair. 1. Calderon may not have really won the presidential election. After a controversial election full of allegations of fraud and corruption, Calderon was declared president by a margin of 0.56%. Hundreds of thousands of supporters of rival candidate Andres Manuel Lopez Obrador swarmed the Zocalo in Mexico City to protest the decision and demand a recount. Obrador and his supporters occupied the Zocalo for seven weeks before Calderon was declared the winner again after a partial recount. 2. 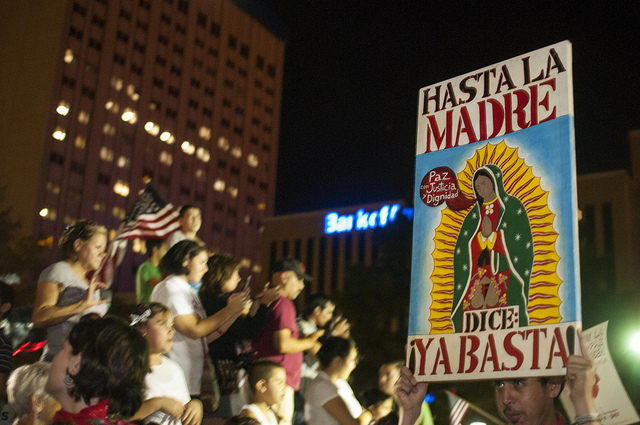 Calderon’s legacy in Mexico is one of violence. Days after assuming the presidency, and with the chaotic election still overshadowing him, Calderon declared war on drug cartels. His widely criticized military offensive resulted in rampant violence across Mexico. A mass peace movement, led by poet Javier Sicilia, traveled through Mexico and the United States to demand an end to Calderon’s war and counter the government’s claim that the war only killed drug traffickers. Families shared stories of loved ones lost to the violence. During his six-year term, more than 100,000 were killed. 3. 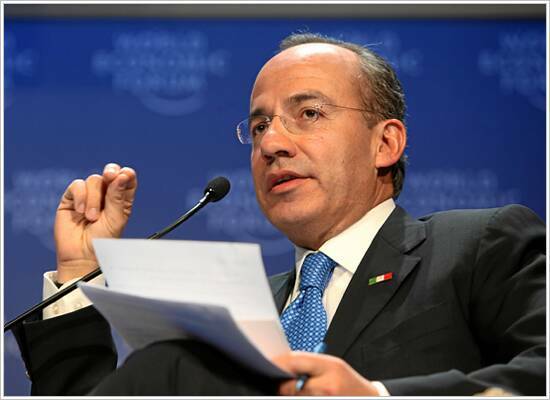 Calderon’s Plan Merida uses U.S. funds to commit human rights violations, like Ayotzinapa. To fund his war, Calderon signed Plan Merida, a “security” agreement between Mexico and the U.S. with the purported purpose of fighting the drug war and organized crime. Since 2008, the U.S. has sent nearly $3 billion in aid to Mexico and continues to do so, despite calls to end it because of human rights violations committed by the very military and police that Plan Merida funds. The latest violation is the disappearance of 43 students in Ayotzinapa, which has prompted mass protests around the world. Follow Gozamos.com’s board #Ayotzinapa Global March Feb 26 2015 on Pinterest. Despite Calderon’s violent legacy, the president of Judson University took a page from Harvard’s book and described Calderon’s visit as “neat,” saying that Calderon has made a difference in the lives of many families. Agreed–particularly on the families of those 100,000. If Calderon could only see the irony in that statement.